Campers embark on a climbing adventure! 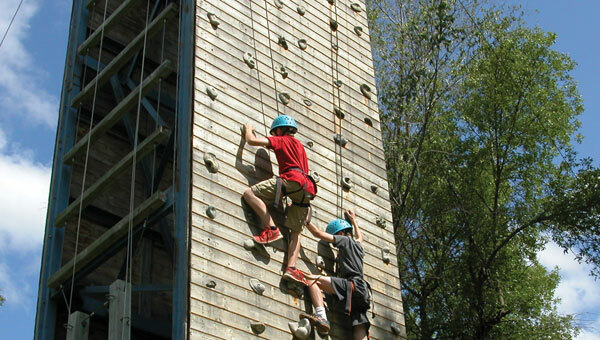 Campers will gain new skills and self-confidence every day through a variety of climbing activities. Campers test their strength, strategy, and skill while learning safety procedures, belay techniques, knot tying and proper climbing techniques. Campers will get a chance to test their skills during a one day-trip to Vertical Endeavors. Kids looking for some radical new experiences this summer can kick it up a notch with a week packed with fun team building experiences. This camp is designed to build self-confidence and teach valuable skills through challenging activities while enjoying an unforgettable adventure. The remainder of the day will be spent enjoying traditional camp activities. Campers will spend three days traveling outside of camp to the Southdale YMCA Skate Park, Taylors Falls and Camp Streefland High Ropes Course. The remaining two days will be spent at camp enjoying traditional camp activities. The day of Taylors Falls, campers will return to the Southdale YMCA at 5 p.m.